UV lamp insect killer will make your life more comfortable, ensuring there are no insects such as mosquitoes and the moth flying around. Whether you are in your house, at the office, or on a vocation, you can always have this electronic device with you because of its small size and simple operation. 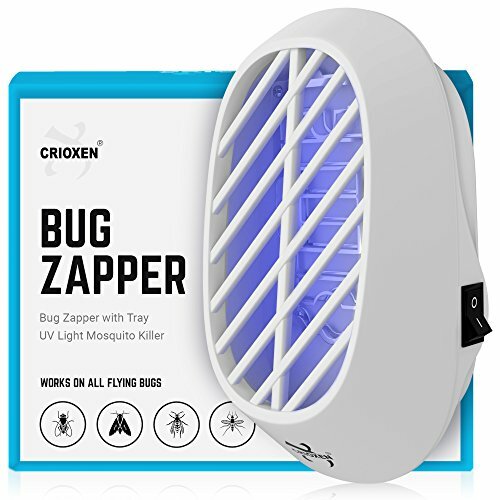 Bug zapper lamp uses high voltage to kill the insects with no chemicals involved, being absolutely safe for humans and animals. Indoor mosquito killer is made of eco-friendly materials and is durable. Flying insect catcher collects bugs in a special tray which is easily and quickly cleaned with a brush. Our indoor fly zapper has a small form factor, yet it covers a large 500 square foot area. Mosquito Insect killer plugs into a regular outlet and has a single button to turn it on or off. FULL PROTECTION - The plug-in bug zapper is the easiest and safest way to rid any premises of insects. 4 UV LEDs emit light, attracting bugs to kill them in seconds with high voltage. CONVENIENT - mini inside mosquito killer is of a small size, makes no noise, no smell, is odor free, and has no chemicals. Great for kitchens, cafes, and hospitals, it can protect up to 500 square feet. EASY TO OPERATE - Indoor mosquito trap can be simply plugged into a power socket to protect your space. The bug collection tray is easily cleaned without any problems, using the provided brush. NON TOXIC- Fly zapper kills bugs with electricity - there are no chemicals in the air, so it's totally safe for people and pets. It can also be used in areas where pesticides can't be sprayed. DURABLE AND ECO-FRIENDLY - Our insect killer for home, office or travel is made of odorless nontoxic materials approved by RoHS and REACH. It's also very durable, so it will serve you for a long time. If you have any questions about this product by Crioxen, contact us by completing and submitting the form below. If you are looking for a specif part number, please include it with your message.